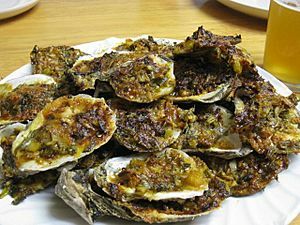 Oysters are a family of bivalves with rough, thick shells, the Ostreidae, plus some other types which are called 'oyster'. Many species are edible, and are usually served raw. They are also good when cooked. In history, they were an important food source, especially in France and Britain. 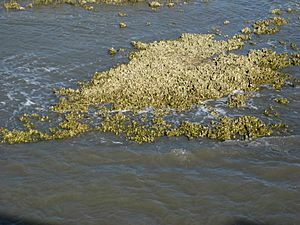 They used to grow in huge oyster beds, but were "overfished" in the 19th century. Nowadays they are more expensive, so eaten less often. 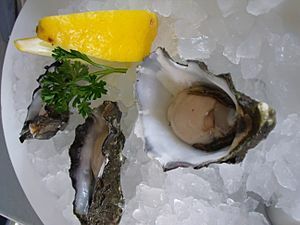 Some of the unrelated 'oysters' are the pearl oyster, Pinctada, which is a clam, and a few mussels which look a bit like oysters when they are taken out of their shells. 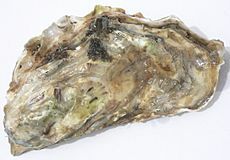 Special knives for opening live oysters, such as this one, have short and stout blades. Oyster Facts for Kids. Kiddle Encyclopedia.